Mr. Bo9agr: Bangkok, here i am !! 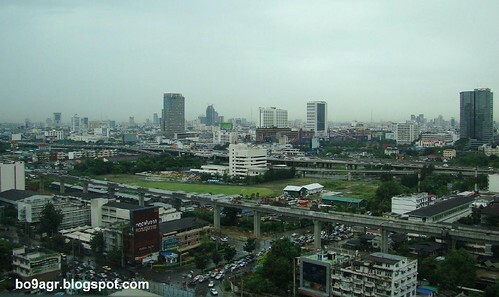 yup, i arrived yesterday in bangkok - thailand, the weather is soo nice, not that humid, with a little bit of rain drops. i'm staying in the 19th floor of Amari Atrium hotel which is an excellent hotel in the center of bangkok, everything is close by, you can get to most shopping malls and plazas by taxi. this is my 2nd visit to bangkok, the 1st one was back in 2000 , now bangkok has changed alot, it's alot cleaner than it was seven years ago, and more people speak english. my last visit was a shopping trip and that's it, i didn't see anything in bangkok but shopping malls , but this time, we booked some outsite trips to see the city around, like the Safari trip, the floating market and many other places.. i'll take as many pictures as i can - as usual - and post them on my flickr page.. Kap Khoon Khap ! !